My dad’s birthday was Wednesday, so we went for food at a local pub, called The Golden Farm, to celebrate. It’s re-opened under new management and this was our first time trying the new menu. Wednesday is their grill night! Steaks, chicken, cumberland sausage, scampi and a vegetarian dish were offered, as well as a few specials. I chose the garlic chicken dish and Dad enjoyed a gammon steak with egg, the meals were cooked by my sister’s partner who works there. All the dishes were served with garlic bread, chips and a side salad, mum and Ryan had Cumberland sausage and Kelly (my sister) had a pasta bake, Ryan and I provided dessert. My dad’s favourite chocolate bars are Double Decker and, inspired by the Caramac cake I baked for my mum’s birthday last year, Ryan and I decided a Double Decker cheesecake would be the perfect dessert for his birthday. My sister brought it out after we finished our mains and we sung him ‘Happy Birthday’ before trying a slice, it was delicious! This is my first cheesecake so Ryan gave me a lot of guidance and, after tasting it at the pub, suggested adding a little vanilla to the filling and a little salt to the biscuit base next time. 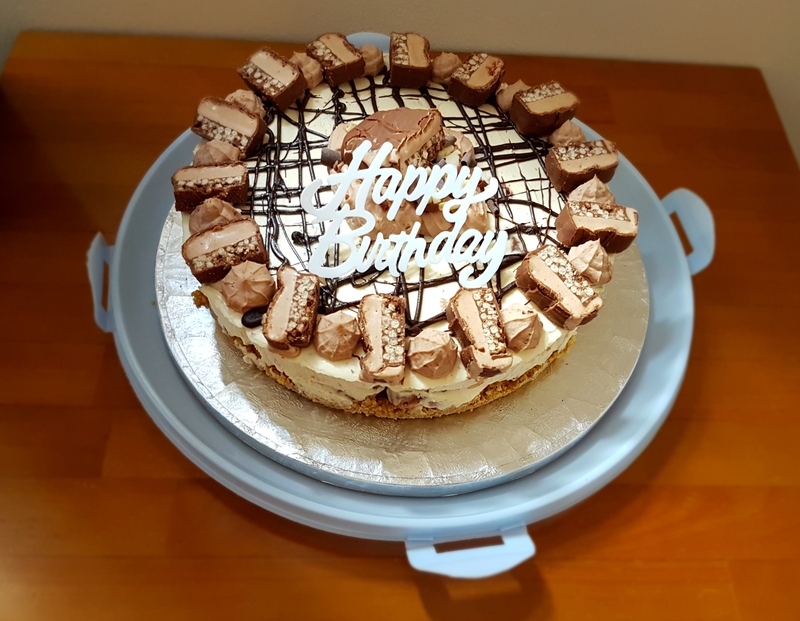 We had a Digestive base with mascarpone and double cream for the filling, and decorated it with chocolate and Double Deckers (similar to mum’s Caramac cake). Put the biscuits in a zip lock / sandwich bag and gently crush with a rolling pin, careful not to pierce the bag. Melt the butter in the microwave on short burst, then combined with the crushed biscuit. Tip into an 8″ round cake tin and smooth with a pallet knife. Whisk the mascarpone and icing sugar until smooth, then pour in the double cream. Continue to whip the mixture until it starts to thicken and forms peaks. Fold in the chopped Double Decker pieces and pour the mix onto the biscuit base. Smooth with a pallet knife and leave to set in the fridge overnight. Once the cheesecake has set, remove from the tin. Whip the double cream, icing sugar and some of the melted chocolate until it is pipeable. Drizzle over the remaining melted chocolate, then use a large star nozzle to pipe around the circumference of the cheesecake and some in the centre. Add a piece of Double Decker between each pipe and one piece topping the choclate in the centre, then sprinkle the chocolate curls on top. This looks soooo delicious and I love the ‘no bake’ part..
Oh yes Please!! This looks and sounds delicious, definitely my kind of dessert!